Brown Box Movers will move you across the street or across the states. Whether you are relocating within Texas or moving to a different state, we can relocate you! 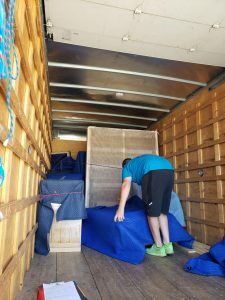 We have experience with relocation to Oklahoma, Atlanta, Boston, Chicago, Tennessee, Colorado, Louisiana, California, Virginia, and all the states in-between. 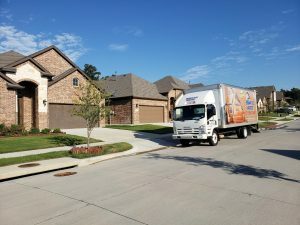 Finding a reputable moving company to relocate your belongings may be a difficult task, Brown Box Movers is here to help you; by providing our unique standard on interstate relocation. With having 500+ online reviews speaks volume. Our team will provide you with customer service as well as efficiency to get your move done right. With having communication from our staff; you can rest easy and plan accordingly, allowing freedom to plan your itinerary and assurance that your furniture will arrive when you expect and need items. Other long distance movers may provide you a delivery window ranging from several days up to a month leaving the customer waiting and unsure when their precious items will arrive. Moving across the state or even moving out of state can be challenging, but Brown Box Movers is here to help you in every way possible. One way we are unique is the same moving crew and truck that arrives to load your content is with you on the journey & relocation to your new destination. You will not share space with any other customer’s belongings, so you don’t have to worry about missing furniture or receiving anyone else’s belongings. The truck is exclusively used for your content, no sharing. We keep it simple Load…Drive…Unload! Our pricing is straightforward with no hidden fees. Upon calling in for a quote one of our representatives will set up an in-home estimate. This gives our team a true picture of the content that our team will be moving. A binding estimate is always given in writing based on your inventory list & content. We do not weigh trucks and charge extra fees for underestimated weight. Our pricing structure is based on the content, the number of movers, miles, and truck size needed. Call us today for a free quote!